I have had the honor of reviewing Sandra Magsamen products a few times, and have never been disappointed! I absolutely love her products! I know I say that in every review I do of her items, but I cannot stress enough how much I truly do love them all! 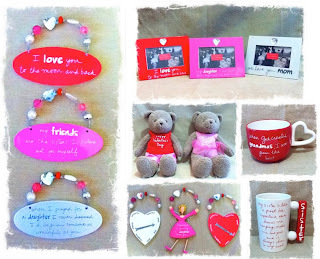 For my Valentine's Day review, I received a picture frame, wall plaque, mug, and beautiful necklace. I have yet to put a photo in the picture frame (need to get some printed!) but it will make a nice addition to my night stand by our bed. It's such a pretty frame! And the necklace...I cannot stress enough how much I am IN LOVE with this necklace!! It's sooo beautiful, and I can pair it with any outfit, and it dresses up the most simple, plain outfit so easily! I wore this necklace out the day after I received it, and got soooo many compliments on it! This is a must have and by far my most favorite part of jewelry (next to my wedding rings and charm bracelet with the kiddos birthstones...hehe). Unfortunately, the mug got broke on the way to me, so I am waiting on a new one, but I am sure I will love that too. You just can't go wrong with Sandra Magsamen products! They decorate your home beautifully, and make the perfect gift for anyone in your life, for any occasion! You can purchase these and other products from Sandra at your local Walmart! To enter, simply read and FOLLOW ALL instructions in the Rafflecopter form below!